Chances are, though, that you’ll want to add software on your Linux machine, just as you would on any Windows or Mac machine. I know I did. I wanted to add Skype so that I could videoconferencing capabilities to my nifty little netbook. Other software I’d suggest you consider downloading more or less immediately is DropBox (cross-platform, cloud-based filesharing/syncing between all of your computers) and VLC (cross-platform video playback software). Let’s look at how you install software on a Linux machine. c) download packages and “compile from source”. If you’re brand new to Linux, you’ll probably want to stick to the first technique for now–it’s easier for you and safer for the data on your computer. Let’s see how it works. 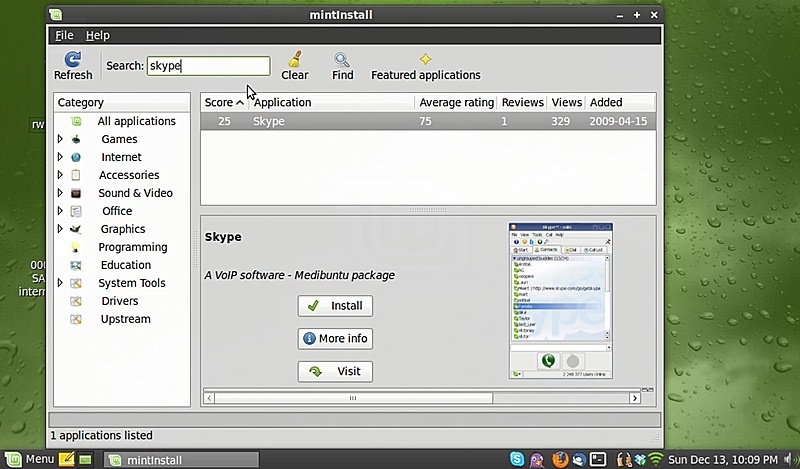 c. Select Skype when it gets found, then click on the “Install” button. After the installation process is completed, go ahead and close the windows of the installer. You may need to restart the machine before some applications will work. You can launch the new application by clicking on Menu -> Applications -> Internet (in the case of the Skype application), or Menu -> Applications -> All applications and selecting it from the list there. If you decide that you’ll be using this application, or any others, more frequently, you can click-drag the application from the Applications window down into the bar at the bottom of the window. Once the icon is down there, you can launch the application by just clicking on that icon. We’ll talk a little more about the other ways that you can install software at some point in the near future. In the meantime, just because we’ve installed Skype on the Mini 10v, don’t think we’re in the clear yet! If you launch Skype, you may well find that the video works just fine, but the internal microphone on the Mini 10v doesn’t work.